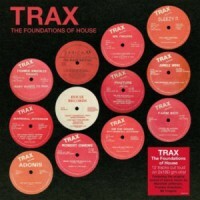 Trax Records is the iconic Chicago label that played a major part in the birth of House Music This release features the original sounds of House by Marshall Jefferson, Frankie Knuckles, Mr Fingers and more. 12 essential tracks cut on 2x LP 180g heavyweight vinyl with printed inner sleeves. READ: A Chicago house greatest hits LP across two discs. Perfect for soundtracking weddings, bar mitzvah's, children's birthdays and 'in an all back to mine scenario' of the millennials and older. Coffee table tackle!